Tata Nano, world's cheapest or most affordable car would have turned a decade old by mid-July this year. The use of the future imperfect tense here is deliberate. Even though the company has not officially said it, the last of the Nanos may have already been produced. Tata Motors has not produced a single Nano this year so far-January to March - and only one car part from the inventory of 2018 was delivered to a customer in February. This marks a new low in the journey of the car that could never deliver on the hype that preceded its unveil in 2008 and launch the following year. Forever dogged by perceptions of a "cheap" car and dwarfed by its overbearing Rs 1 lakh price tag, sales of the Nano have always been underwhelming but in the last few years, it has reduced to a trickle. In fiscal 2019, mere 376 Nanos were delivered to customers. That is almost half of what its direct rival that also happens to be India's bestselling car-Maruti Alto - sells in a day. The lack of demand for the car is such that trying to produce it on a continuous basis in a factory no longer made sense. In June last year, Tata Motors decided to make it in the Sanand factory only if there were orders placed by customers. It was also the month when sales of the car had hit a new month-low of just three units. In the subsequent months, Tata kept producing and selling a few of them-on an average 52 cars every month between June and December, but it was evident the end was near. This year, it has quite literally hit rock bottom. The company maintains it has not taken a call if and when it will withdraw the car from the market. Nano's descent into ignominy has been well documented but it still makes for an engaging read. At its peak in 2011-12, its sales touched 74,527 units. It has been a downward slide ever since despite repeated attempts at propping it up including giving it a full facelift with the GenX Nano replete with an automatic transmission in 2015. Nothing has worked. The stigma of being a cheap car and questions over its quality and durability that first surfaced after a dozen cars caught fire in its initial days have stuck but beyond the low sales, there are other reasons that may have precipitated the end. This month, India embarked on the implementation of new safety norms for cars with anti-lock-braking system becoming mandatory on all cars. This will be followed by standard driver side airbag, speed warning system, seatbelt reminder, rear parking sensors and better structural stability to withstand crash testing in ensuing months. In its current form, these features make Nano unsaleable in the market--it is one of the few cars in the country to not offer ABS and airbags even in its top of the line variants. Upgrading it to meet these norms is possible but needs investment, which does not make sense given the low volumes. Even cars like the Omni van from Maruti that still have takers - nearly 80,000 unit sales In fiscal 2019 - have been discontinued as it did not make sense to upgrade them. Rumours of its end have circulated for quite some time and even the die-hard optimists will struggle to make a case for the Nano now. Yet, given that it was a dream project of Tata Group Chairman Emeritus Ratan Tata, it is a sensitive topic in the boardrooms of Tata Motors. Most senior executives refuse to speak on the future of the car and those who do are mostly defensive about it. Nano also found itself in the centre of the controversy between Tata and former chairman of the group Cyrus Mistry in the fag end of 2016 when the latter alleged that the car had reached a peak loss of Rs 1,000 crore. Mistry would go on to say that Tata Motors was unable to close down the project due to emotional reasons. The company may not have spoken but the customers have. 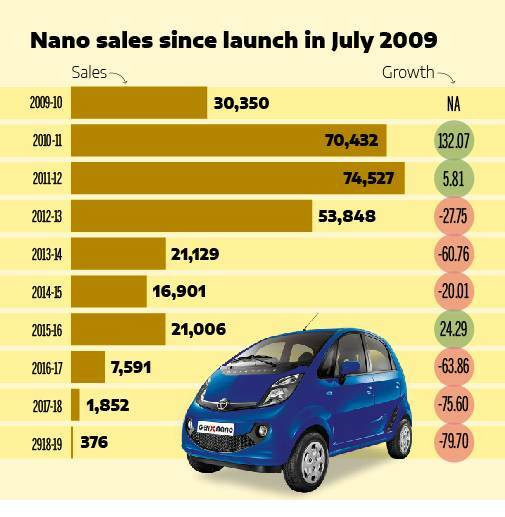 The first three months of this year clearly show that Nano has no takers in India. The official announcement of its end is merely a formality now.